Bring the water (including mushroom soaking water) and salt to a boil in a medium saucepan. Whisk in the polenta. Stir constantly until it begins to thicken. Reduce the heat, cover and simmer for 10 minutes. Pour the polenta into a shallow lightly oiled glass baking dish and smooth out to about 1/2 inch thick. Refrigerate 1 hour or until the polenta is firm. Slice the polenta into squares or rectangles. To prepare the sauce, heat the oil in a skillet and sauté the garlic, onions, and mushrooms for 4 to 5 minutes. Add the spaghetti sauce and basil. Cover, reduce heat and simmer for 15 to 20 minutes. 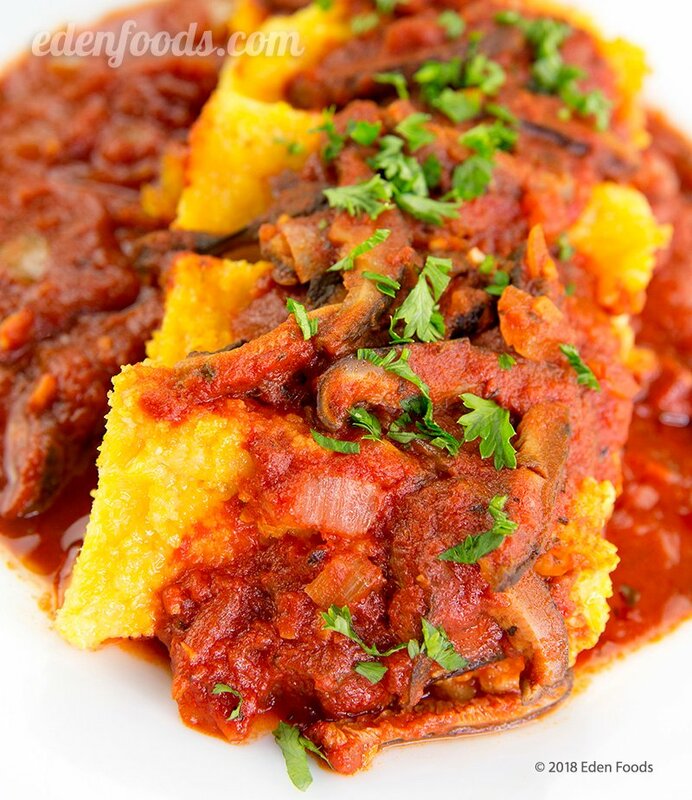 While the sauce is cooking, pan fry the polenta. Oil a cast iron skillet or griddle with safflower oil and pan fry the slices on each side until golden and crisp. Place on a serving platter. Ladle the tomato sauce over the polenta when serving. Garnish with parsley.